Realism can also be a view about the nature of reality in general, where it claims that the world exists independent of the mind, as opposed to non-realist views (like some forms of skepticism and solipsism, which question our ability to assert the world is independent of our mind). Philosophers who profess realism often claim that truth consists in a correspondence between cognitive representations and reality. 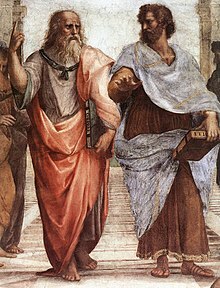 ^ The statement veritas est adaequatio rei et intellectus ("truth is the adequation of thought and thing") was defended by Thomas Aquinas. ^ Laird Addis, Greg Jesson, Erwin Tegtmeier (eds. ), Ontology and Analysis: Essays and Recollections about Gustav Bergmann, Walter de Gruyter, 2007, p. 107. ^ Nick Zangwill, The Metaphysics of Beauty, Cornell University Press, 2001, p. 3. ^ John Marenbon, Medieval Philosophy: A Very Short Introduction, Oxford University Press, 2016, p. 72. ^ a b c d Gestalt Theory: Official Journal of the Society for Gestalt Theory and Its Applications (GTA), 22, Steinkopff, 2000, p. 94: "Attention has varied between Continental Phenomenology (late Husserl, Merleau-Ponty) and Austrian Realism (Brentano, Meinong, Benussi, early Husserl)". ^ Liliana Albertazzi, Dale Jacquette, The School of Alexius Meinong, Routledge, 2017, p. 191. ^ Sean Creaven, Marxism and Realism: A Materialistic Application of Realism in the Social Sciences, Routledge, 2012, p. 33. ^ Michael Resnik, "II. Frege as Idealist and then Realist," Inquiry 22 (1–4):350–357 (1979). ^ Bertrand Russell, Philosophy of Logical Atomism, Open Court, 1998 . ^ Ludwig Wittgenstein, Tractatus Logico-Philosophicus, Routledge 2001 . ^ Austin, J. L., 1950, "Truth", reprinted in Philosophical Papers, 3rd ed., Oxford: Oxford University Press 1979, 117–33. ^ Karl Popper, Conjectures and Refutations: The Growth of Scientific Knowledge, 1963. ^ Gustav Bergmann, Logic and Reality, Madison: University of Wisconsin Press, 1964; Gustav Bergmann, Realism: A Critique of Brentano and Meinong, Madison: University of Wisconsin Press, 1967. ^ Putnam, H., Realism and Reason. Philosophical Papers, vol. 3. Cambridge: Cambridge University Press, 1983. ^ Putnam, H. Realism with a Human Face. Edited by James Conant. Cambridge, Massachusetts: Harvard University Press, 1990, p. vii. ^ A. M. Ferner, Organisms and Personal Identity: Individuation and the Work of David Wiggins, Routledge, 2016, p. 28. ^ Paul John Ennis, Post-continental Voices: Selected Interviews, John Hunt Publishing, 2010, p. 18. ^ Mackay, Robin (March 2007). "Editorial Introduction". Collapse. 2 (1): 3–13. Blackburn, Simon (2005). Truth: A Guide. Oxford University Press, Inc. ISBN 978-0-19-516824-2.